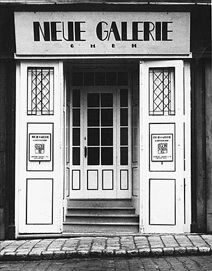 The Galerie St. Etienne’s predecessor, the Neue Galerie, was founded in Vienna in 1923 by Jane Kallir’s grandfather, Otto Kallir (1894-1978). Having opened with the first posthumous Egon Schiele retrospective, the Neue Galerie was also the exclusive Austrian representative of such major artists as Alfred Kubin and Oskar Kokoschka. In 1930, Otto Kallir rescued from oblivion the legacy of Richard Gerstl, today ranked with Schiele and Kokoschka as one of Austria's major Expressionists. Also in 1930, Kallir published the first catalogue raisonné of Schiele's paintings. Kallir functioned as a publisher of limited edition prints, working with such artists as Max Beckmann, Johannes Itten, Oskar Kokoschka and Alfred Kubin--all of whom he knew well. After immigrating to the United States in 1939, Otto Kallir established New York's Galerie St. Etienne and helped to introduce Austrian Expressionism to this country. Looking for art that captured the uniqueness of his newly adopted homeland, Kallir became interested in American folk art and was among the first to recognize the importance of Anna Mary Robertson (“Grandma”) Moses. After World War II, he was one of the only dealers to assist with the restitution of art looted during the Holocaust. The gallery’s archives proved instrumental in reviving this issue in the 1980s and ‘90s, and continue to serve as an important resource for provenance researchers. In 2004, the collector Ronald Lauder honored Otto Kallir by naming his New York Museum of Austrian and German Art the Neue Galerie.